Cover letter example for a Assistant Manager job in the UK. Amend as suitable and start applying for job vacancies. 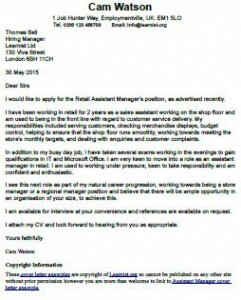 I would like to apply for the Retail Assistant Manager’s position, as advertised recently. I have been working in retail for 2 years as a sales assistant working on the shop floor and am used to being in the front line with regard to customer service delivery. My responsibilities included serving customers, checking merchandise displays, budget control, helping to ensure that the shop floor runs smoothly, working towards meeting the store’s monthly targets, and dealing with enquiries and customer complaints. In addition to my busy day job, I have taken several exams working in the evenings to gain qualifications in IT and Microsoft Office. I m very keen to move into a role as an assistant manager in retail. I am used to working under pressure, keen to take responsibility and am confident and enthusiastic. I see this next role as part of my natural career progression, working towards being a store manager or a regional manager position and believe that there will be ample opportunity in an organisation of your size, to achieve this. View more covering letter examples.